The Motown legend wrapped a nine-show engagement at The Venetian Theatre in Sin City on November 21, and her kids, including Black-ish star Tracee, son Evan and his wife Ashlee Simpson and daughter Chudney Ross were all in attendance to cheer on their mum. But Tracee was stunned when her superstar mother unexpectedly asked her to step onstage to sing her rendition of Lady Sings The Blues, and the actress admits she was frightened to join Diana in the spotlight. "I think the last time my mom asked me to sing I was 5 or 6 years old," Tracee writes on her website. "I swear at first I thought she said Evan (my brother, a singer, who was also there). But then I realized she said my name, and before I could think, I was walking toward the stage! "Now, I’m not afraid of much. I used to be afraid of everything. I was shy as a child. Probably tough to believe, but it’s true. I still get nervous all the time but I never let it stop me and I’m certainly not afraid of performing. But, somehow, by the time I stepped onto the stage it was as if I was 6 years old again! "There’s something about singing….. It’s no joke trying to do that as the child of Diana Ross, let alone while standing by her side on stage. Plus, when you’re nervous, it’s hard to hear, it’s hard to breathe, and it’s hard to be present. These are all important things when you are singing!" "There is no way to describe the pressure, the fear of what it feels like to allow my voice to be heard as Diana Ross’ child... All my life I have witnessed her as Diana Ross the icon and Diana Ross the mother, and I have experienced her seamlessly bridge this incredible dichotomy with grace and ease. She is a nurturing and fierce mom, intimate and ancient, in a setting that isn’t meant to support mothering: on stage with the whole world watching." 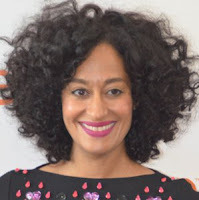 In the video Tracee shared on her site, she can be seen walking on stage stunned as her mum hands her the microphone and hushes the crowd by saying, "This is important!" The crowd cheered Tracee on as she hugged her mum before leaving the stage. "My favorite part was me burying my head into her shoulder," Tracee concludes. "It has been ages since I’ve hidden so deeply in my mother’s embrace and it was awesome."